There’s a lot that goes into buying a home, a lot more than is usually assumed. This is especially true if you are a first time home buyer. 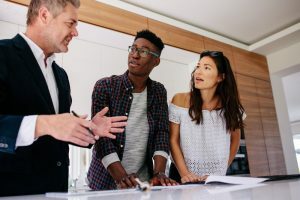 Home buying can be a tricky process, and it can even be frustrating, if you’re working with a team of people who don’t have your best interests in mind. Luckily, there are ways to make sure that you’re getting a good deal and that you’ll be happy in your new home for years to come! Here are a few of our tips for first time home buyers. As with all aspects of your life, you don’t want to spend more money than you can realistically afford. When you meet with your lender or loan officer, they’ll go over your debt to income ratios, and make sure that you are able to afford your monthly mortgage payments. If you don’t think you’ll be able to afford a certain amount, make sure you only look at houses that are within your budget. Even if you’re not quite ready to buy, getting pre-qualified helps you a lot with the buying process! While a pre-qualification is not a guarantee, it will help the owners of the home that you’re hoping to buy, be more willing to accept your offer because you seem serious and less likely to back out of a deal. It will also make the process of buying a house a lot faster, as you won’t have to wait to get qualified before putting in an offer. When you imagine your future home, what does it look like? Is it natural hardwood floors throughout the entire home? Vaulted ceilings? An island in the kitchen? Write out a list of the things you want, and the things you know you don’t want, in your future home. This will help you avoid wasting time to go and look at a listing that has things you don’t like. It can be hard to not let the pressure get to you, when you’re looking for a new home. This is especially true if you’ve been searching for a long time. So when a house that you almost love, or is almost good enough comes along, you may be tempted to take it. But don’t settle! If you won’t be happy in it, you shouldn’t spend money on it. Similary, if you love a house, don’t hesitate! In the current market, a house can sell within a matter of hours. If you love a house, put in your offer!